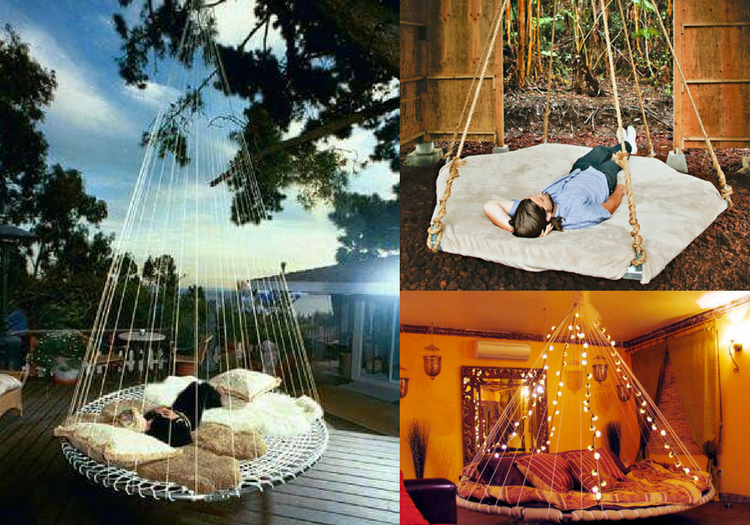 As this is a hanging day bed, you won’t need the trampoline legs. Using a screwdriver, unbolt and remove them from the frame. This may require a little effort if there is rust and dirt present. If you have trouble, use a wire brush to remove and buildup on the screws. Apply oil if needed. The springs are a necessary part of the trampoline, but they’re also a hazard for fingers and toes. Wrap the springs in rope or strips of cloth so no skin or body parts can get caught in them. They should be wrapped several times until they form a cushioned layer. You can also add foam under the cloth or rope to enhance softness. To make this daybed extra cosy, add a layer of foam, cut to size. Or for an easier option, layer with blankets following installation. Now it’s time to suspend the DIY daybed. It’s important to consider the tension in the trampoline mat. Over time, the mat will sag. To prevent this, make sure you run the ropes under the mat to provide added support. When you’re done, bring all rope ends together and tie off using a strong knot. You’re almost done building your DIY daybed! All you need to do now is hang it up. This should be done from a strong support, like a sturdy tree branch or the solid beams from a verandah or pergola. You can also build a steel tee-pee shaped frame. Whatever you use must be capable of holding the daybed as well as the weight of people laying on it. What’s a bed without a few fluffy cushions to keep you comfy? Dress up your new suspended haven with blankets and cushions, and if you’re feeling creative, try draping fabric around the support ropes to form a cosy, tipi-style enclosure. You’ve now upcycled that old, unwanted trampoline, into your family’s new favourite hangout. But remember, on this tramp there’s no jumping allowed!